Hydrocarbon combustible waste gases are challenging to measure due to their wide flow fluctuations caused by variable production and refining processes. With its highly sensitive thermal mass flow sensing element, the GF90 Flow Meter also precisely measures gases of varying hydrocarbon composition. This makes it the ideal gas measuring solution for ultimately eliminating these dangerous, polluting gases. With a highly sensitive thermal mass flow sensing element and microprocessor-based intelligence featuring multiple calibration groups built into the design, the advanced GF90 Flare Gas Flow Meter delivers precision flow measurement to a low 0.25 SFPS. A flow meter that accurately measures combustible hydrocarbon waste gases for flare system disposal ensures that these dangerous byproducts are safely and efficiently eliminated from the environment with minimal pollution. The disposal of flare gases protects people, equipment and complies with air quality regulations. The versatile GF90 features a thermal mass gas flow sensing element designed with 316 stainless steel and nickel-braze construction. It also can be specified with corrosion and abrasion-resistant alloys, including Hastelloy, Monel and tantalum, and with all-welded construction for service in the harshest environments. It is available for service in a broad range of applications—operating at temperatures from -73 to 454ºC and pressures to 69 bar (g). Designed for complex multi-gas or variable flow processes, the GF90 Flow Meter includes an advanced microprocessor-based programmable transmitter. The transmitter can store up to three calibration groups. To obtain accurate flow measurement in complicated gas processes, each group can be independently configured for a specific calibration range, fluid, switch point settings, etc. The instrument is also inherently multi-variable, providing both flow and temperature measurements without any additional tap points. Developed with constant power technology, the GF90 features turndowns from 1000:1, accuracy of +1 percent of reading plus 0.5 percent of scale, with repeatability of +0.5 percent of reading or better. Flow sensitivity is from 0.08 to 487.7 NMPS [m/sec at a normal temperature of 21.1ºC and pressure of 1.013 bar absolute]. The GF90’s transmitter features two independent, field programmable analog signal outputs of 4-20 mA, 0-10 Vdc, 0-5 Vdc, and/or 1-5 Vdc., which can be assigned to any combination of flow and/or temperature. It also offers dual alarm switch points with relay outputs. The switch points are user, field programmable to alarm at high, low or windowed and can also be assigned to flow and/or temperature readings. Dual 10A relay outputs are provided for contact closures to lamps, alarm and control systems. A NEMA Type 4X (IP66) rated transmitter enclosure is standard. Optional Class I and II, Division 1 and 2, Groups B, C, D, E, F and G [EEx d IIC] transmitter enclosures are also available with agency approvals for Factory Mutual Research, ATEX, CSA. GOST/RTN, IEC, CPA and NEPSI. Offshore production platform operators and oil/gas process engineers now have a reliable, cost-effective solution for measuring the flow of combustible hydrocarbon waste gases in flare gas system operations. 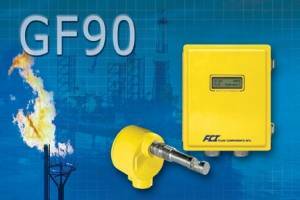 The GF90 Flare Gas Flow Meter from Fluid Components International (FCI) solves the problem of measuring dangerous, explosive and toxic gases that often flow at extremely varying and/or low levels.